Phronk.com: Run quickly when on the iong bridge with loosing planks! Run quickly when on the iong bridge with loosing planks! This is one of the funniest things I've seen in, like, 2 hours. This is the box for a "railway" set for kids. 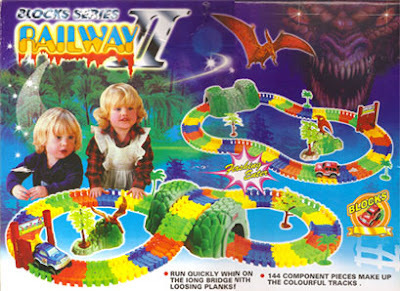 Although *I* would have loved dripping blood and a demon on my railway set as a kid, most kids would probably find it a bit weird. Click HERE for a full explanation, and to see what other treasures the box contains. P.S. Comments are broken again. Boo.